I haven’t heard from the owner of this rice hull house in a few years. Yesterday I came across some new comments by the builder and thought it would make a good update. 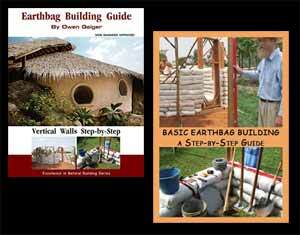 A reader had sent a message pointing out how rice hull houses can be built like the strawbale house the other day. (Round, pipe bond beam, etc.) So yeah, here you go. Here’s the step-by-step directions for a rice hull house. Note how lightweight fill materials such as rice hulls require some extra reinforcement from rebar, posts, buttresses, etc. for stability. In contrast, heavy earthbags filled with tamped soil are much more stable. Also note how Paul added wide roof overhangs to better protect the walls. “The house is entering its 4th rainy season and is generally in good shape. I’ve re-plastered the outside once during that time. The privacy wall, exposed to the elements, is not doing quite so well. I ended up covering the natural plaster with a cement plaster, and patches have to be applied periodically. Eventually I’m afraid the privacy wall will have to go. But the house is standing strong and the walls do an amazing job insulating from the heat outside. I installed a hemp ceiling which is starting to mold so I’ll need to replace that soon, with what I’m not yet sure. Anyway, later this year I intend to do a follow-up video to show the completed house.